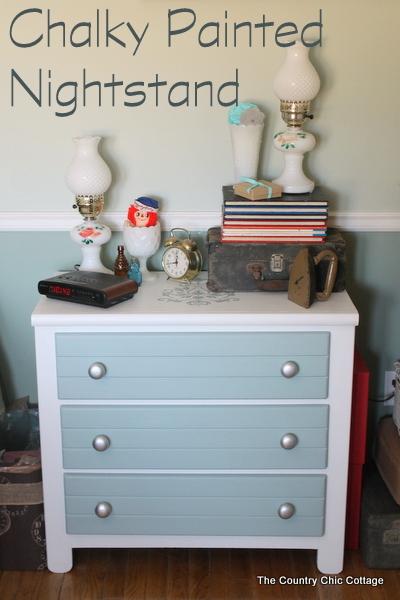 My chalky painted nightstand is completed and I just couldn’t wait to share it with y’all. I am so happy with the way this project turned out. It has been almost three years since I painted the last nightstand that was here and I was ready for a change. It turned out to be a transformation that was just what my bedroom needed. I picked up a small dresser at a second hand furniture store for $65. It is solid wood and the shape was perfect for my needs. However the paint job that they had given it to try to sell it was…um…not my style. 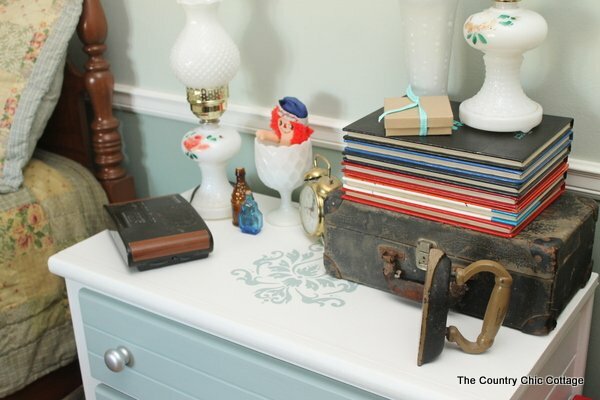 I used Americana Chalky Paint from DecoArt to give the entire piece a makeover. I painted the chest itself with Everlasting and the drawer fronts with Vintage. This post is part of my design team status with DecoArt however all projects and opinions are my own. The chest was already white so just going over it with one coat of chalky paint was sufficient. 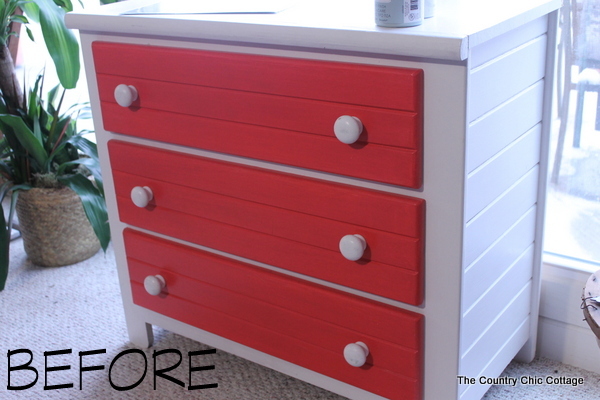 It took two coats of vintage to cover up the day glow red on those drawers however. Once the white chalky paint was dry on the chest, I used a brocade motif stencil also from DecoArt on the top. I used a removable adhesive sprayed on the back to ensure clean lines. Then the chalky paint in vintage applied to a stencil brush. Make sure to use a very dry brush and apply light coats when using a stencil. 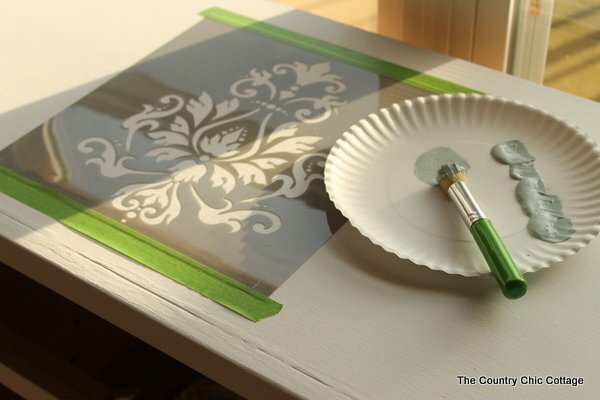 Remove your stencil as soon as you are done painting. Now for the hardware on the piece, I loved the size and shape of the hardware on the original but they are painted wood and I was not loving the look. 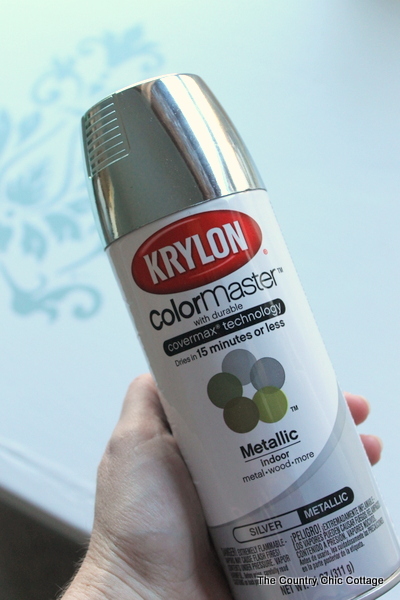 So I grabbed some silver metallic spray paint from Krylon and gave the hardware a few coats. It did the trick! The hardware was perfect in a shiny silver. After the entire piece was dry, I applied two coats of Americana Creme Wax to protect the surface and give it a bit more shine. NOTE: When starting with chalky finish paint for the first time, be sure to read the tips and techniques page and watch the instructional videos. I moved my nightstand into place and loaded it up with fun vintage treasures. It is the perfect height to use as a nightstand and all of those drawers offer up storage that was desperately needed in this room. I am in love with how the stencil on top turned out. It breaks up the top and adds detail to the otherwise plain piece of furniture. And there are those spray painted knobs. Pretty great huh? Much better than painted white knobs on this piece. 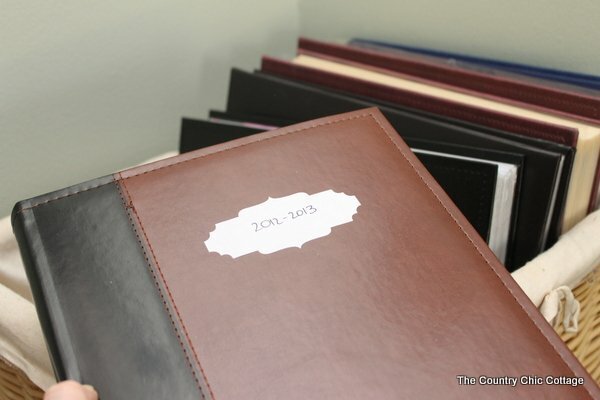 I also organized 40 plus years of photos in this space while I was cleaning and organizing my bedroom. You can read more about the labels used in my organized craft closet post. Now my chalky painted nightstand and a stack or organized photos have their homes in my bedroom. The bonus? It does not look like a cluttered wreck. Gotta love that. This post is part of my design team status with DecoArt. Product and payment were given to me in exchange for my participation in the program. All projects and opinions are my own. 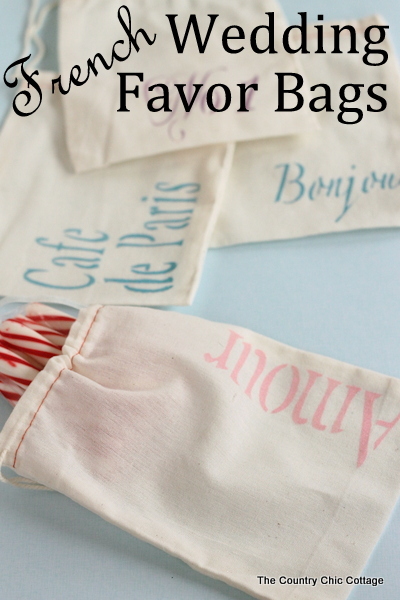 Make these french wedding favor bags for your DIY wedding. These are quick and easy to make and will be perfect for any Parisian themed wedding. This is part of a DIY wedding ideas series over at Crafty Hangouts. Y’all be sure to check out all of the videos there. 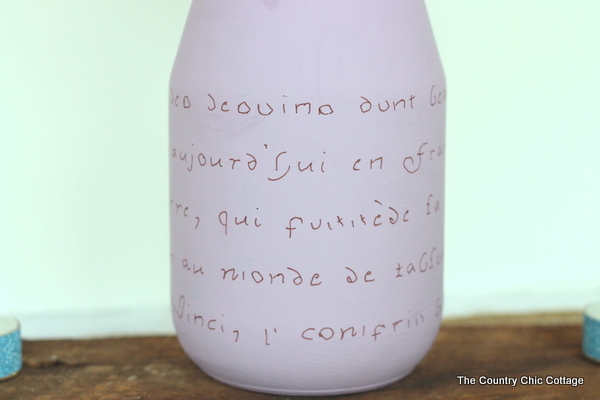 For a french themed wedding, also be sure to check out my french script mason jar vase. Both of these projects use Americana Chalky Paint that was supplied by DecoArt for our hangouts. You can watch the video below as I make the French wedding favor bags. I am shooting this hangout with Carolina from 30 Minute Crafts and she has a DIY wedding favor for you as well. The video is a little over 8 minutes long and y’all can see the details on both favor ideas. Great right? The paint and the stencil that I used for these are both from DecoArt and were supplied to me as part of my design team status with them. 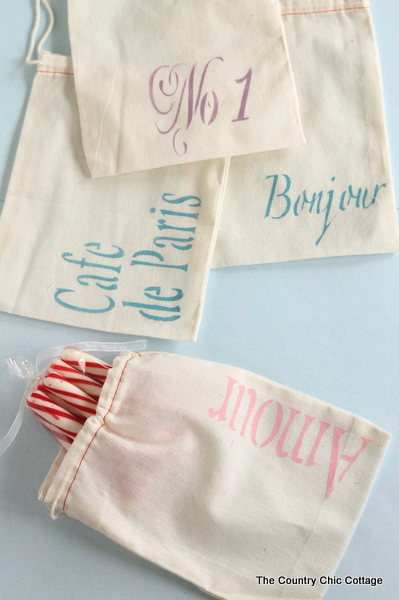 Add these fun French wedding favor bags to your Parisian themed wedding. You can make an entire stack of them in under an hour. Products used in this post were provided to me free of charge however all projects and opinions are my own. 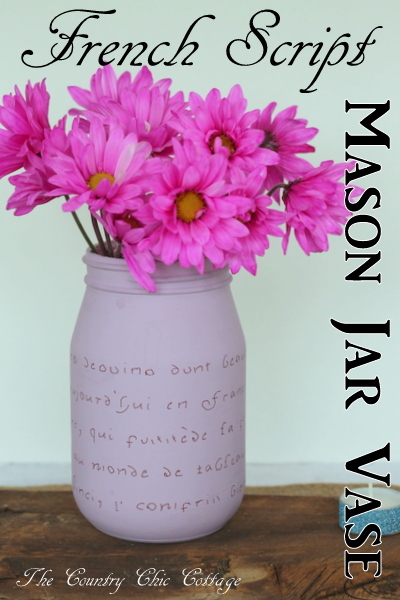 It is time once again for Crafty Hangouts week and I am kicking things off with my french script mason jar vase. You can check out tons of DIY wedding ideas all week over at Crafty Hangouts. 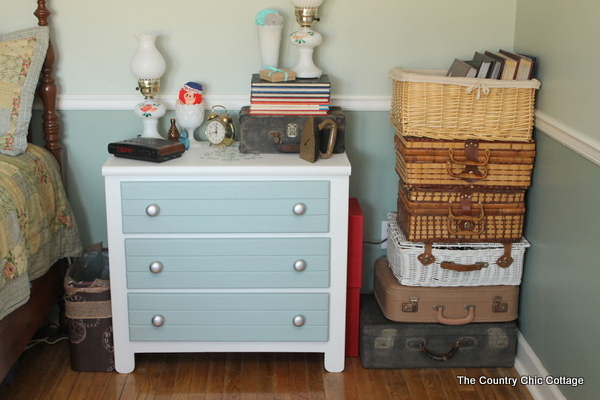 This week’s hangouts are sponsored by DecoArt and their amazing Americana Chalky Finish paint. I am joining Carolina from 30 Minute Crafts for my videos and first up we are crafting with mason jars. Your not surprised are you? If you are having a french themed wedding, this french script mason jar vase is the perfect DIY wedding idea for you. You can watch me make this one live in the video below. I used the Americana chalky paint on the jar itself. Please note that you need a smooth jar with no logo for this DIY wedding idea. I then used a Sharpie marker over a french script stencil. If you have amazing handwriting, I would suggest you translate a quote you love and write it on the jar in French. That would make these french script mason jar vases extra special. Just add water and flowers to your vase for a great wedding reception centerpiece at your wedding. What quote will you use? Are you having a french themed wedding? Maybe a wedding with a Parisian theme? 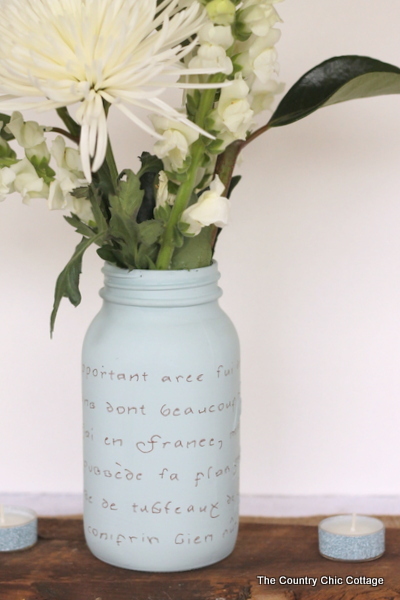 These french script mason jar vases are the perfect DIY wedding idea for you! Stay tuned to Crafty Hangouts for more DIY wedding ideas all week! My college aged daughter was missing a bookcase from her new apartment so over the holidays I painted an unfinished one for her. I thought I would snap a few pictures and share with y’all. Especially because it turned out AWESOME! 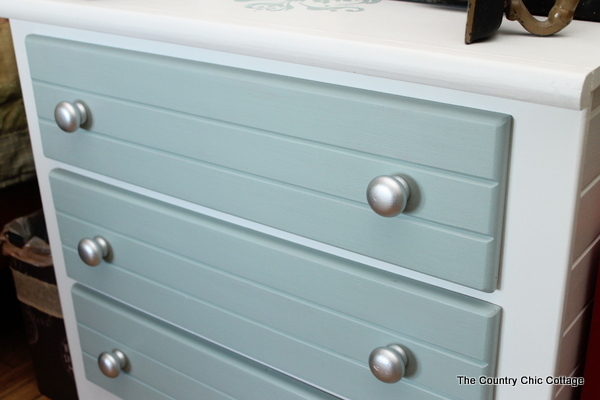 I was lucky enough to be provided the new Americana Chalky Finish Paint as part of my work on the DecoArt design team. The paint I must say is amazing. For y’all that want to know, it is available online at Home Depot but will be in stores soon. 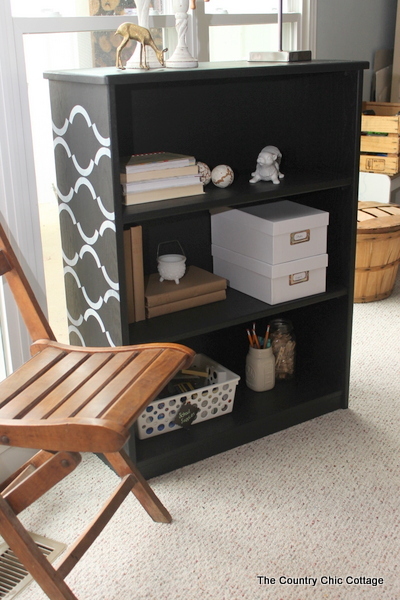 I started with a raw wood bookcase that I purchased from an Amish store here locally. I am a believer in quality made furnishing so that was my choice. 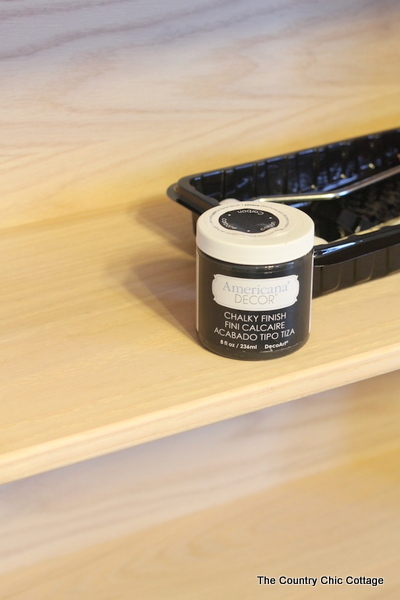 You can use this paint on any unfinished or finished piece of furniture. 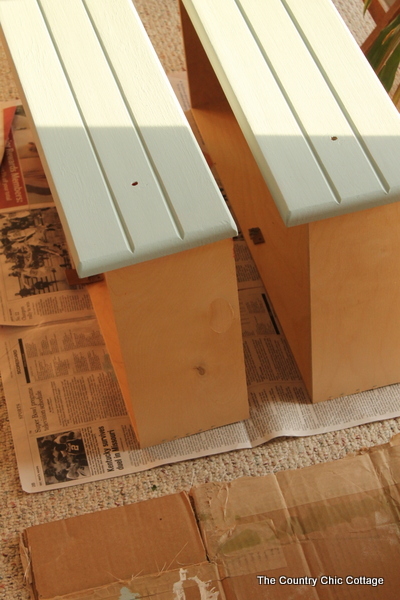 The best part of the Americana Chalky Finish Paint was that I didn’t need a primer. I dove right in with the paint in Carbon and a foam roller. After two coats of black paint my bookcase was looking wonderful. 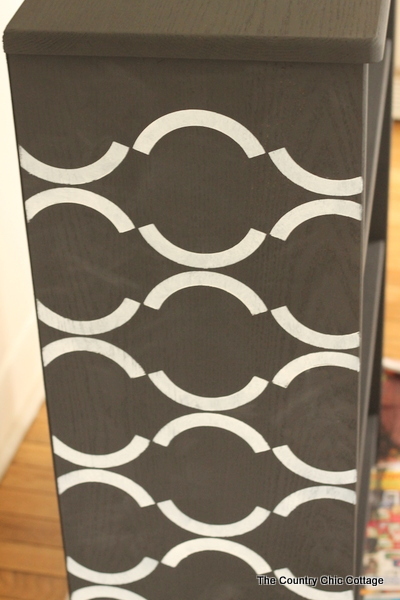 I then grabbed a stencil that I used on by DIY container garden stand and to revamp a vintage cabinet. You can purchase your own version from Royal Design Studio. 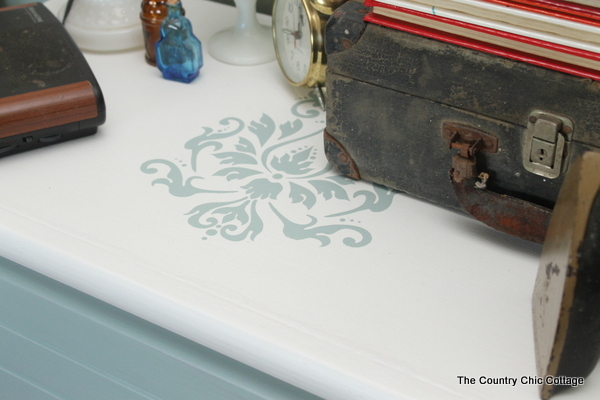 I used the Americana Chalky Finish Paint in Everlasting for the stencil detail. Just once light application and I was thrilled with the results. NOTE: Picture below is before wax and looks a little dusty from my stencil adhesive. The finished product after wax looked amazing. I then gave the gave the entire projects two applications of clear creme wax. The wax is also available as part of the Americana Chalky Finish Paint line. It goes on super easy and I buffed it to a super glossy finish. Please head on over and watch the videos, read the instructions, and follow directions if you are going to dive into a project using the chalky finish paint. They were a life saver for me and now that my painted bookcase has fully cured it is off to the college apartment. Did you tackle any paint projects over the holidays? Are you dying to try out the new Americana Chalky Finish Paint? Stay tuned for more projects using the paint right here or head to the chalky finish Pinterest board that DecoArt has put together. 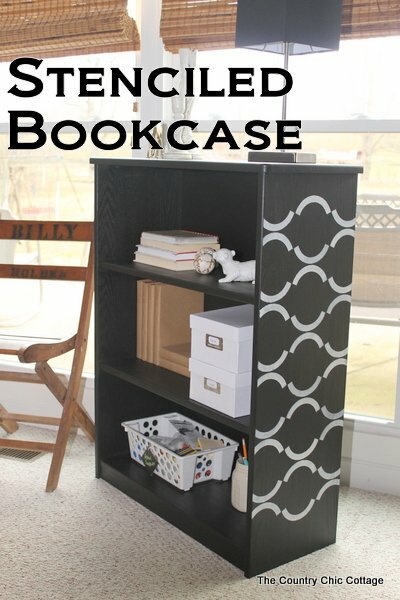 I hope you enjoyed my stenciled bookcase as much as I enjoyed painting it. This post is a part of my work for the DecoArt design team however all opinions and projects are my own.